Giant Eagle Weekly Ad, Giant Eagle Weekly Sales Flyer. 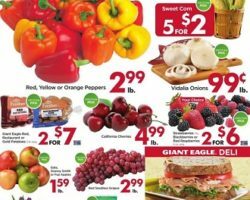 Get This Week Giant Eagle Ad sale prices, grocery savings, weekly circular specials, digital coupons, and offers. Most Giant Eagle locations have a Pharmacy staffed with caring professionals. Save with the Giant Eagle Advantage Card – earn free fuel with fuelperks! – Simply swipe your card at the register and with every $50 you spend in the store you’ll earn 10¢ per gallon at GetGo. – Add eOffers (digital coupons) right to your Advantage Card, then redeem them automatically at checkout. – Giant Eagle fuelperks! Credit Card – earn an extra 4¢ off per gallon of fuel for every $50 you spend inside Giant Eagle and GetGo. Giant Eagle Departments and Services: Bakery, Cheese Shop, Dairy, Deli, Grocery, Meat, Produce, Seafood, Contact Lenses, Entertainment, Household Products, Beauty Products, Banking, Cafe, Photos, Western Union, Wireless Center. Giant Eagle supermarkets are located in: Pennsylvania, Ohio, West Virginia, Indiana and Maryland.